Chatting with the jazz vocalist before her concert with Gregory Porter. 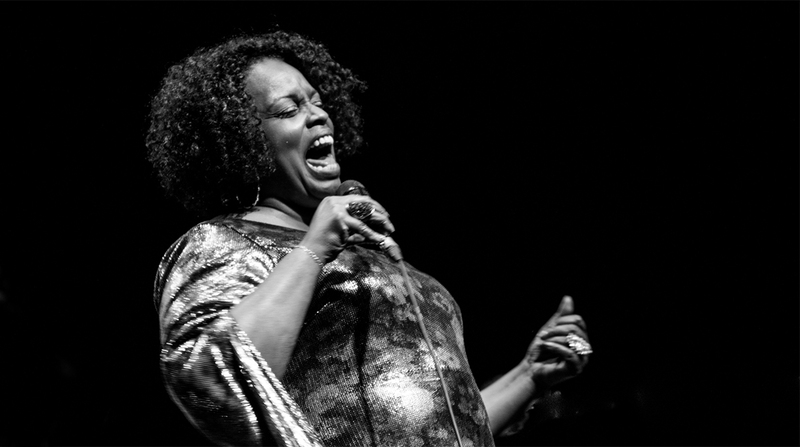 In 2016, Dianne Reeves was the veteran and Gregory Porter the up-and-coming artist on a bill at the Segerstrom Center for the Performing Arts in Costa Mesa, California. Several months before the concert – which was subsequently reviewed here at which she would be joined by pianist Peter Martin, bassist Reginald Veale, drummer Tarreon Gully, and her longtime guitarist Romero Lubambo, we spoke as background for a feature in the venue's online newsletter. Here is that conversation. THEATERTIMES (Cristofer Gross) You and Gregory Porter, with whom you will appear in Costa Mesa, have some history together. He appears on your latest recording. For many in the audience, you may provide be his introduction to them. How did you meet? REEVES In France, we would always be at the same festivals, and a lot of times we would sit in with one another. It was always a lot of fun. I first had the opportunity of him sitting in with my gig at the Montreux Jazz Festival, because he's phenomenal. THEATERTIMES My first exposure was hearing him on your recording. REEVES You have to catch up. THEATERTIMES Definitely. Do you think you'll perform that song together in Costa Mesa? REEVES We'll see. We've never done it together live. THEATERTIMES On the discography . . .
REEVES Welcome to my Love actually came out in 1981. My first recording contract with Palo Alto Records and that was actually my first album as a leader, and it was called Welcome to My Love. It's called the Palo Alto Years now, because when I went with Blue Note, about eight years later, they bought the old masters and reissued that one as the Palo Alto Years. THEATERTIMES Those early years, when you began your recording career, were different for the music business. Was that at all important? REEVES I think the biggest things was music wasn't just for entertainment, but a way of life. Growing up, people didn't play instruments, they played really great music in the family. So early on listening to the music of the adults, like Ray Charles, and then, when black radio and Motown first came on the radio, you would just sit up and listen to the music all day long. That was in the '60s. Later on a lot of the artists started to be very socially and politically conscious and the music was not just for the beat but for the mind and all was for the soul and it just fed you in another way. It was music of hope and moving forward. And I loved it. And as I continued to grow. At the time I grew up, the whole thing of genres wasn't as strong as it became later on. It was there, but it wasn't like it is. There were no fences and boundaries around music, so you would have rock musicians very, very excited that a jazz musician would play their song, or they played together and you'd go to concerts and you could see Ravi Shankar and Miles Davis at the same concert. So it was a wonderful kind of real world music experience early on. That was the atmosphere that I grew up in. Everybody had their own voices, nobody sounded like anybody and you knew who you were listening to. Those were extraordinary times. REEVES I think it became more of a business. It was a way of trying to control the sound, finding a kind of recipe for hits. Then what happens is the artist would do certain things for for this recipe and and the audience became less of an active listener. Everything becomes kind of spoon fed. THEATERTIMES The business goals drive the art and inevitably the core of inspiration at the heart of it changes … kind of shrivels. REEVES Well, I think the business kind of ate itself. There is a lot of stuff that is superficial that is on the top that are big hits and stuff, but there are these amazing things right under the surface by extraordinary young musicians who are coming out of gospel music. Gospel music and hip-hop is there culture, and they're very learned musicians who have distinct voices and ways that they wish to tell the story and it's amazing. And with the dawning of downloading music, you have to go and find some of this music or be a part of a group of people who are listening to this music, but it's out there and there's just extraordinary musicians that are just really doing it. And they have blurred the lines and the music is just . . . I listen to it and I just wonder wow! … how did they come up with that? It's great, you know. I love it. And actually Gregory is one of those because he's an amazing songwriter and storyteller. His lyrics are just stunning. And he's become loved all over the world in a short amount of time. THEATERTIMES These guys weren't born when "What's Goin On" came out. They approach it fresh. Your album does as well as anything in making that music sound new today. REEVES Well I'm excited about that because of the people that I asked to be on the album. It was a collaborative kind of thing. it was really, really nice and the person that I hold very responsible for that is Terri Lyne Carrington, who is an extraordinary musician and producer. We worked on projects in in the past – but this one was a lot of fun. I had done her Mosaic project and we were out on the road, and I was discussing with her what I wanted to do and she started sending me ideas and I thought, Let's do this! She has one foot firmly planted in the tradition of jazz music and then another in the music of what's going on. I mean she's like the perfect bridge. And so her skill and musicianship, and just overall ability is just extraordinary. So I got a chance to work with Gerald Clayton, and I loved that because I've worked with his father [bassist John Clayton], you know. And then I got a chance to work with Laila Hathaway, and just all of these, . . . Sean Jones, and Tia Fuller, who did a majority of the horns on the record, Tinaka Postma, who's another wonderful sax player. And it was just great. THEATERTIMES You mention trumpeter Sean Jones. In that song you do with him, you sound like you have a great rapport with that instrument. I read that may have to do with your mother? REEVES You know it's so funny. I said that one time and now my mother has become this trumpet player. THEATERTIMES It was in high school she played. REEVES Yeah, it wasn't anything she pursued. She was just part of a band, a high school band like a marching band type stuff. But, she loved music but she said I could never be a trumpet player 'cause I just wasn't good. But I love the sound of the instrument. Even very early on, when I would listen to Miles, the thing that I loved about the tone of his trumpet is that he could change and make you feel certain things either with vibrato or no vibrato and I loved the sound of that. And then when I heard Milton Nasciamento on the Wayne Shorter album I thought, Wow, this voice to me is like Miles. I think that defining my voice kind of came from him and other horn players. THEATERTIMES And Clark Terry was a big influence on you? REEVES Very early on, he was a mentor. He was the one who just showed me the road and put me in these extraordinary places with him, and these masterful musicians. That's actually how I met Terri Lyne. She was 10. We were there playing for Clark at a Festival in Wichita, Kansas. I was singing and she was on drums. Immediately there was a connection and I'll never forget. We were in the dressing room and I grabbed her and set her up on the counter and I just started talking to her. I don't even know how all of that came about, but I just did, and from that point on we had each other's address. I didn't see her again until she was 18 years old, but through that whole time we wrote back and forth. She was my pen pal. We wrote back and forth about everything. And kept in touch. And I was working with Harry Belafonte and we had a concert in Boston. I said, I'd really like to get together with you. She came and I remember us just talking. Then I was moving to New York and that's when she was 18 and moving to New York. That's how we came back together. She's like my little sister. THEATERTIMES You mentioned her songwriting, and you also write music. How important is it for you to write? REEVES Well, now, that is the norm in the industry. Every young person coming up, they write their own stuff. It's amazing. I love it. It's very important to have your own voice, but they are all songwriters. And they can produce their own things – everything, they do everything. So that is pretty much the norm. It wasn't so much when I was growing up. But, right now it is. THEATERTIMES Art changes, it doesn't get better. It changes, but art either is or it isn't. REEVES Truly. I think the change is that it continues to push the boundaries. It just keeps moving forward. Things that you once heard in Gregorian chants, when all there was were notes that were sung because they had a certain kind of dissonance. And then music continued to grow and people were like 'No, actually it feels good,' and they do that and extraordinary men, started to take on different kinds of shapes and ways of being expressive. It just continues to move forward, and that's what I love about it. The music that I came out of, I thought wow you couldn't go any further than that. And I'm hearing this music now and I'm thinking, how do you hear that? That's extraordinary, it makes total sense, it was always there but you hear it now.